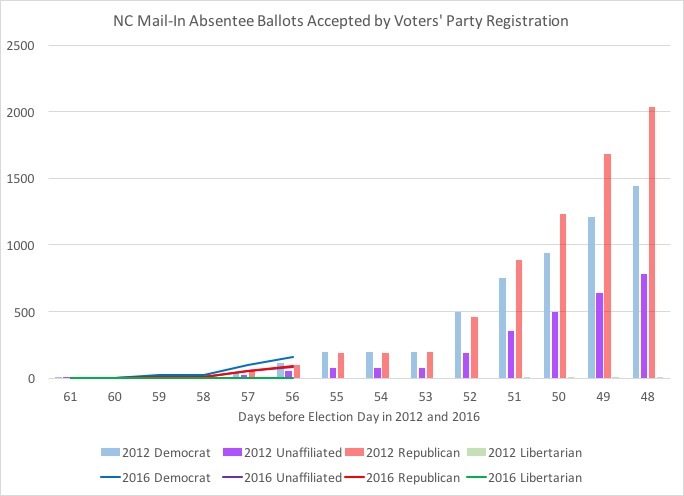 Several folks (and reporters) have inquired about the pace of the mail-in ballots so far in 2016 (with only 4 days of accepted ballots so far) to the first few days of 2012. 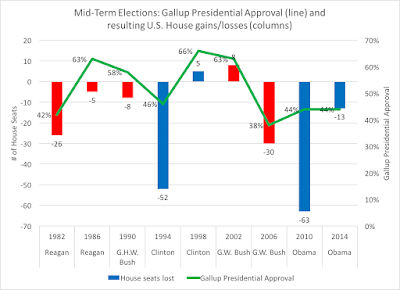 In the below chart, the columns represent the cumulative party registration of voters who had mail-in ballots accepted in 2012, while the lines indicate the cumulative party registration of voters who have had mail-in ballots accepted so far in 2016. While it's hard to tell from the line indications in the early days so far (the registered Republican line hides the registered unaffiliated line), registered Democrats are at 144 percent of where they were the same comparable day in 2012 with their accepted mail-in ballots, registered unaffiliated voters are 153 percent of their same-day 2012 numbers, and registered Republicans are 91 percent of where they were on the same day in 2012. 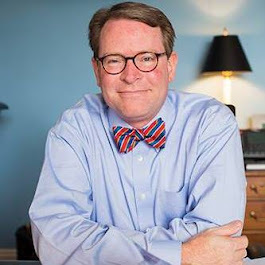 A word of extreme caution: it is still VERY EARLY in the process to make any definitive analysis or conclusions so far regarding the pace of mail-in ballots in North Carolina. 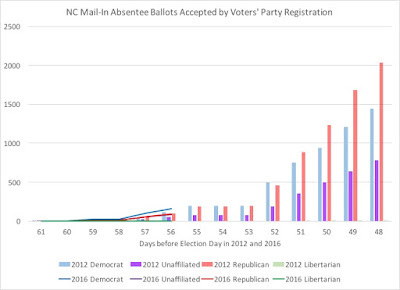 As you can see in the later part of the above graph, Republicans tend to take over the advantage when it comes to mail-in balloting and are a disproportionate percentage of the mail-in absentee ballots cast. Give it another another week & half or two weeks and we'll compare the numbers to see how things are progressing (above 2012, at the same level, etc.) before any definitive analysis can be rendered.